Cleaning Dolls | Barbie Who? One of my main goals with Barbie Who? is to only use dolls that I have found at thrift stores. I have been very lucky with my finds thus far, but most of the dolls I buy do need some cleaning before they are ready to be used. I had to do some minor cleaning to the Flower Power Teresa doll, and I will detail my method here. The main thing to remember when cleaning a doll is that you should use the smallest amount of effort and chemicals possible to get it clean. Yes, I may be able to use mega cleaner X to remove grime on the doll quickly, but it could cause discoloration of the vinyl or removal of paint from the doll’s face. Therefore, I start with water and a mild soap and work my way up to more abrasive measures only as a last resort. Today, I will be cleaning up the doll I am using for Peri. The main concerns are some green and black paint marks throughout her body and a black permanent marker stain on her foot. There is also some dirt and general grime on her, but that is par for the course anytime you buy a used doll. The hardest part will be removing anything on her face without ruining her makeup. I like to start cleaning with dish soap. I usually buy original blue Dawn, but I also use citrus Ajax sometimes. It just depends on which one I am using to wash dishes with at the time. Some people say to avoid anything with citrus, but I have never had a problem because I always thoroughly rinse the dolls in water after cleaning them. If you don’t fully rinse off a citrus cleaner, it may cause issues, so you should always use caution with them. Anyways, I started cleaning her with warm water and a few drops of soap. I used a microfiber cloth for the first round of cleaning, a cotton dishcloth for a second scrubbing round, and a Q-tip for the nooks and crannies of her face. I made sure to be extra gentle around her face paint so as not to rub any away. Much to my surprise, everything came off with just soap and elbow grease. Here are the results! Her face cleaned up beautifully. It took a few minutes for me to get a green splotch near her eye, but otherwise I didn’t have any trouble. Q-tips are very helpful when doing work in oddly shaped areas. The microfiber cloth also did a good job of getting in right spaces. I am not sure what the black marks on her body are from. They weren’t marker (thank goodness), and they rubbed off relatively easily. It reminded me somewhat of stuff marks. Although small, these marks took a few minutes to clean off. The larger marks were actually easier to clean than the tiny ones. Here are some before and after pictures for the front and back sides of Peri’s legs. As you can tell from the before pictures, she was well loved by her previous owner. After dealing with the general grime, I turned my attention to the permanent marker stain on her foot. It faded slightly after I washed it, but it was a barely noticeable difference. I did three treatments of the foot with a benzoyl peroxide cream. I used Clean & Clear acne cream, but anything with 10% benzoyl peroxide will work for this application. The treatments didn’t make a real difference, which puzzled me since I have successfully used it before. I asked a friend who restores dolls, and she said that the benzoyl peroxide doesn’t work as well when it is cold. She suggested that I try again when the weather gets hot and miserable. It is frustrating that I can’t do anything more for her foot at the moment, so we may touch base again on cleaning Peri once the weather warms up. 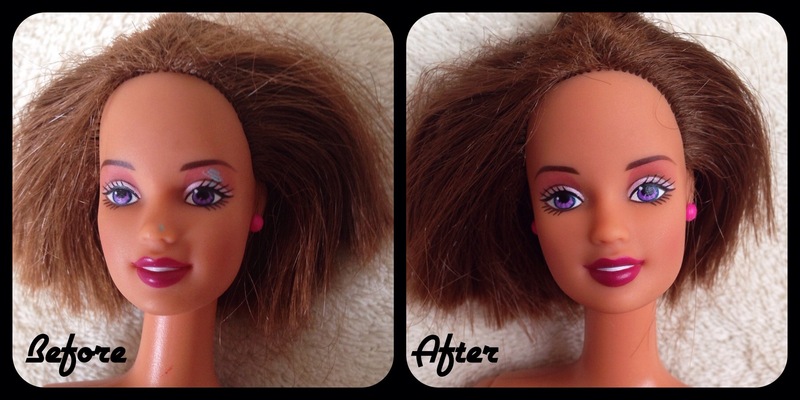 **Update** I forgot to link to my source for the benzoyl peroxide cleaning method to get marker off of dolls. Oops! Here is the link; she has some great pictures with her tutorial. I hope to have similar results once things warm up around here. I finished the cleaning by gently rinsing her hair and body with water. Since nothing was stuck in the hair, I didn’t use any soaps or conditioners on it. I also rinsed her entire body thoroughly to get rid of any soap left on her skin. Next I brushed her hair and left her in a well ventilated area to dry overnight. I think she looks refreshed after all the cleaning. Overall, I am very happy with how the doll looks right now. She is much cleaner than she was when I bought her, and I didn’t have to use anything abrasive to clean her face. Wins all around! For the craftier side if things, I have started knitting a practice piece – a pair of pants for the Ken doll. It is much more challenging than I expected – it is even harder to knit on this scale than it is to crochet. I keep dropping stitches and making silly mistakes. Hopefully I will have something to show for it very soon, and something much nicer for Peri to wear in the near future. I am hoping I can get all the mistakes out with these pants. Keep your eye out for the next post and you can hear all about my first Barbie knitting adventure. You should have been in my house yesterday – that cleaner would have worked perfectly in the heat! It’s amazing how much better she looks after a simple clean. I am dreaming of going south for a mid-winter holiday. 🙂 The wind chill has been dreadful here the last few days. Thank you; I agree that she cleaned up very well. I am so glad I found your fascinating blog. It helps to know there are people in the world who share the same mental irregularities as me. I have cleaned and restored a number of Goodwill and yard sale Barbies in my doll collecting career. I have used hydrogen peroxide, nail polish remover, and acrylic paints to clean and repair dolls, but the dish soap solution is brilliant. It works better in general than any of the other things. 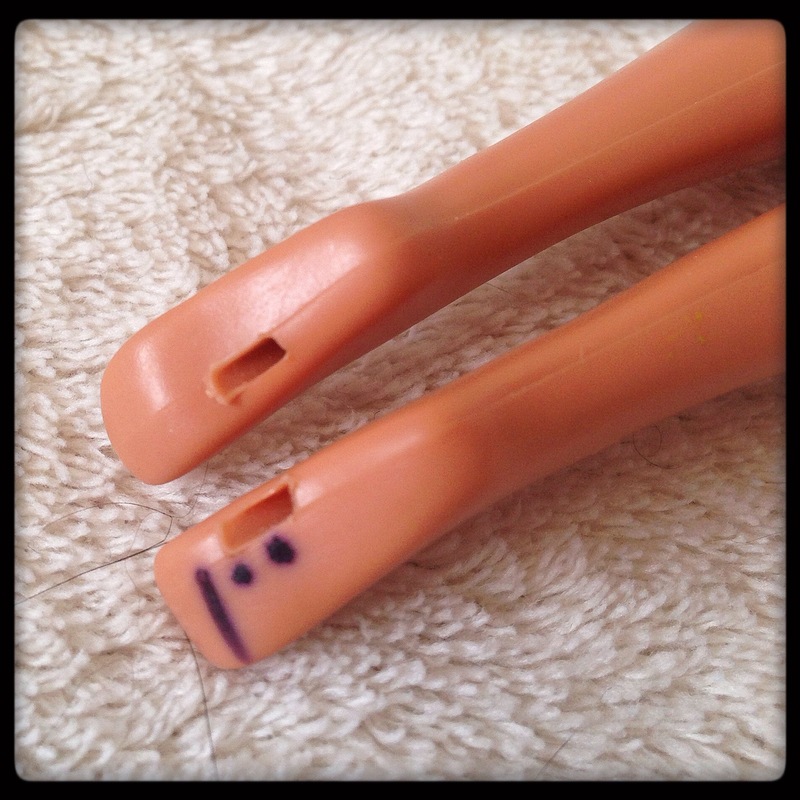 Although certain stains like permanent marker don’t yield to anything without risking melting poor Barbie’s face off. Why do little girls adore giving Barbie facial Maori tattoos? I guess they like that Mike Tyson look. I have a 1960’s Ken Doll who has a permanently reddish-purple complexion. I have a Rapunzel doll who was given a nail polish swimsuit, and I havn’t even started cleaning her because I know it will be a hot mess. It is so frustrating when parents, kids or stores use markers, nail polish, or anything else to mark dolls. Is it really that hard to resist?